On Tuesday evening, Liberty traveled to Westerville North with a goal to reverse recent results and gain the first conference win of the season. The Pattys delivered a complete team effort over the full 80 minutes earning a 2-1 victory. The match started with each team trying to establish the possession advantage and adjust to their opponent’s formations. After a fairly even first half hour, Liberty opened the scoring in the 30th minute when Rachel Davidson hit a laser into the side netting from the left side of goal. Laura Bichsel was credited with an assist. However, the lead did not last long when Westerville North got behind the Pattys defense and slotted home the equalizer in the 34th minute. The half would end with the score at 1-1. In the second half, the Patriots defense firmed up and despite Westerville North’s best efforts refused to be broken down. 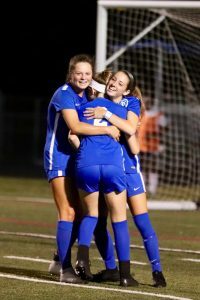 The entire team played with poise and confidence and were rewarded in the 50th minute when Mara Follmer slotted a ball through three North defenders on a quick counter to Emma Lindsey who got behind the back line and calmly slotted the shot past the goalkeeper for what would be the game winner. Westerville North attempted to bring more pressure as the match progressed, but Liberty was calm and managed the balance of the match well to maintain the 2-1 edge. In the earlier match, JVA came from behind to earn a 1-1 draw. Next up for JVA and Varsity is Westerville Central at home on Tuesday, October 2nd at 5:30PM and 7:00PM, respectively. JVB also faces Westerville Central early next week, taking to the turf of Patriots Stadium at 7:00PM on Monday, October 1st.